I think it was the great investor Warren Buffett who said, "Find the lie in the market and exploit it." In today’s market, that lie is about coal. Coal companies are being forced into bankruptcy due to politics. Ironically, that is great news for investors. The last time U.S. coal consumption was this low, Jimmy Carter was president. Despite campaigning on a pledge to save the dirtiest of fossil fuels, President Donald Trump has presided over a faster rate of coal plant retirements in his first two years than President Barack Obama saw in his entire first term. The U.S. Energy Information Administration (EIA) reports that while 15 gigawatts of coal-fired plants were shut down in Obama’s first four years, Trump’s first two years have seen some 20 gigawatts retired (with more than two thirds of those occurring last year). 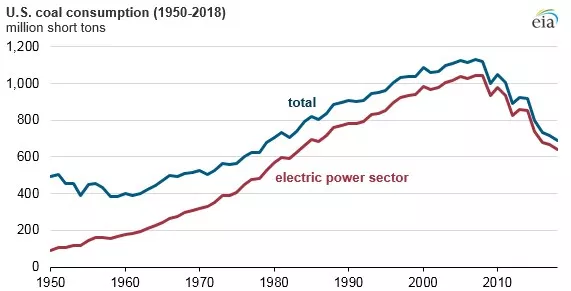 As a result, U.S. coal use dropped 4 percent in 2018 to a level not seen since 1979, according to the U.S. Energy Information Administration (EIA). In terms of coal mining jobs, the Bureau of Labor Statistics reports there were 51,000 when Trump took office, and 53,000 as of November 2018. Mining jobs have gone up slightly because the loss in domestic consumption was offset by a surge in coal production for export in the past two years. That’s right — there are more coal mining jobs now! How can this be? It’s because of exports. U.S. metallurgical coal exports in October totaled 5.29 million mt, up 42.8% from the prior month and up 25.2% from the year-ago month, according to data released Thursday by the U.S. Census. Wow. The lie in the market is that coal is dead, when in fact exports are up 43%. The top met coal export destinations in October were Japan, at 967,447 mt compared with 347,585 mt in the year-ago month; the Netherlands, at 678,277 mt compared with 38,500 mt; and Canada, at 542,966 mt compared with 419,226 mt. The U.S. sent 6 million mt to Brazil last year alone. But it's not just the hypocrites in the U.S.; in the EU, all public subsidies for coal mines ended on January 1, 2019. This means all unprofitable coal mines will close. Germany has shut all of its coal mines. Spain will close 26 mines. When major powers shut down clean nuclear energy, they didn’t replace it with wind and solar like the greens predicted. They replaced uranium with old-fashioned coal. The EU stopped producing coal, which means companies that do mine coal have more pricing power and make more money. At the same time, the stock market has completely discounted these profitable coal companies despite the fact that they pay huge dividends and are booming. The smug sneering is unbelievable. The environmentalists would like you to think they are saving the planet, but in fact they are hurting the poorest of the poor. Coal remains the cheapest form of electricity. Emerging markets such as China, India, and Indonesia want their people to have refrigerators and microwaves and computers just like the West, which is why they are building coal-powered electric plants in record numbers. I've found the best way for you to take advantage of this lie in the markets, and I'm finishing up a report on the companies involved. I'll have it in your inbox soon. The purchasing power of your money is slowly being eroded away by inflation. And unless you're making more money to keep up with the rate of inflation, you're growing poorer by the day... even without spending a dime. Here's how to hedge that.